Many cities and suburbs throughout North America are now in "crisis mode" in dealing with blight. The housing recession and resulting sharp rise in foreclosures deepened concerns about vacancy and blight in many residential neighborhoods. It has also become commonplace in most American cities to pass vacant retail strip centers or dead malls that have been abandoned. Even entire distressed commercial corridors have lost their vibrancy due to factors such as development outpacing demand, the e-commerce revolution, shifting population, or a new ill-conceived highway. Public and political dialog has finally begun to focus on the prevalence and impact of abandoned blighted properties on our communities. Anti-blight declarations have become the political equivalent of elected officials declaring that they are against crime and for education. The prevalence of blight is staring us in the face and forcing community leaders to begin addressing the problem. Blight can be a relative term and is often overused to describe vacant property that is simply boarded-up. The Merriam-Webster Dictionary defines “urban blight” in terms of a deteriorated condition which impairs or destroys. It becomes a long and complicated story to frame all of the causes of property abandonment and resulting blight, but regardless, the prevalence of blight is staring us in the face and forcing community leaders to begin addressing the problem. Blighted abandoned property can be a danger to the public and lead to an increase in crime. This is sometimes expressed as the "broken windows theory -- the effect of urban disorder and vandalism triggering additional crime and anti-social behavior. 1 Blight has a negative effect on surrounding property values, which not only hurts adjacent property owners but reduces local property tax revenue. Abandoned buildings in Philadelphia. Photo by Jukie Bot. Flickr Creative Commons license. 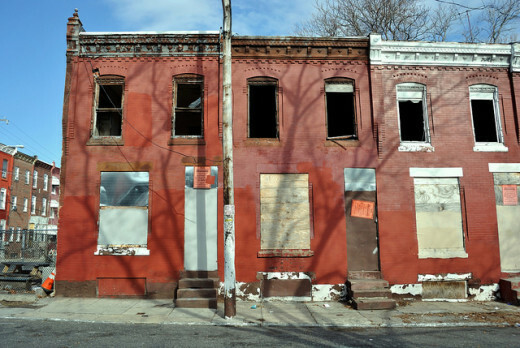 The City of Philadelphia has researched and documented the costs of blight. 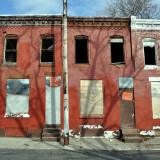 A 2010 city-commissioned study shed light on the steep economic toll long-term vacant and abandoned properties can have. 2 The results are not good news for either property owners or city officials. 1. $3.6 Billion in Lost Household Wealth. Vacant parcels have a blighting effect on nearby properties, reducing values by 6.5 percent citywide and by up to 20 percent in some neighborhoods. This results in an estimated $3.6 billion reduction in property values, an average of $8,000 for each household in the City. 2. Over $20 Million in City Maintenance Costs Each Year. Though the City controls only a fraction of the vacant parcels within the city, it has to bear significant costs to maintain all of them -- waste clean-up, pest control, police and fire -- totaling over $20 million per year. 3. At least $2 Million in Uncollected Property Taxes Each Year. 17,000 vacant parcels are tax delinquent, most by over a decade, owing a total of $70 million to the City and School District in back property taxes. This number increases by at least $2 million a year. Blight was a challenge for New Orleans even before Hurricane Katrina flooded nearly 80 percent of the city’s housing stock in 2005. New Orleans’ Mayor Mitch Landrieu had promised to reduce the number of blighted properties by 10,000 by 2014. Landrieu quickly went to work, strengthening the city's enforcement powers, streamlining the process for remediating blighted properties, and implementing a new computerized system to track code enforcement and permitting. Blight doesn't just affect residential properties. 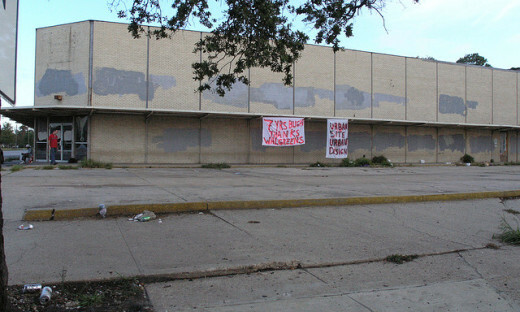 Abandoned stores can cast a pall over nearby neighborhoods. Photo by Bart Everson; Flickr Creative Commons License. For more about the photo, click on it. To coordinate the blight-reduction efforts of various city agencies, the Landrieu administration created “BlightSTAT,” a process in which representatives from the Department of Code Enforcement, the Office of Community Development, the Office of Information Technology and Innovation, the Law Department, and the New Orleans Redevelopment Authority meet to set goals and report on progress. By early this year, Mayor Landrieu had more than made good on his promise, reducing the number of blighted residential properties by about 13,000. Just as blight threatens public safety and harms quality of life, eliminating it creates a virtuous circle. The nonprofit provides technical assistance to communities nationwide, hosts the national Reclaiming Vacant Properties Conference, and offers numerous other resources and services to help communities transform blighted properties into community assets. A growing number of communities have enacted ... strong anti-neglect ordinances." Tennessee cities have a powerful anti-neglect ordinance in the form of the Tennessee Neighborhood Preservation Act. Defendants sued under the act are required by a court to present a plan to make derelict properties livable again. Under the act the court can take possession of a nuisance property and appoint a third party receiver to handle the property if an owner takes no action or cannot be found. Based on the authority of the Neighborhood Preservation Act, the City of Memphis has filed several hundred lawsuits against neglectful property owners over the last four years. 11 Memphis Mayor AC Wharton also said he hopes state lawmakers in Nashville do more to advance blight-fighting legislation to give Memphis and Shelby County more arrows in their quiver. The Anti-Neglect Initiative is designed to develop and implement creative legal and practical strategies to eliminate blighting conditions. The Downtown Memphis Anti-Neglect Initiative aims to improve or stabilize long-term, neglected properties through enforcement of property maintenance regulations and/or legal action. The Anti-Neglect Initiative is designed to develop and implement creative legal and practical strategies to eliminate blighting conditions and to move owners of problem downtown vacant properties towards proper maintenance and eventually either demolition, sale, or full use. After identifying high-priority properties, DMC staff have been working with the owners on development plans or, in some cases, have filed public nuisance suits based on the authority in the Neighborhood Preservation Act. 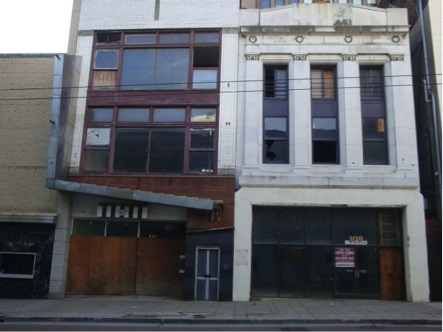 Abandoned and blighted buildings targeted by the Downtown Memphis Anti-neglect Initiative. Photo: Downtown Memphis Commission. In hindsight, it is easy to see how cities and suburbs have evolved to this point considering the real estate development patterns of the last several decades. It seems not that long ago when neighborhoods were built to outlive their current occupants and meant to serve the needs of multiple generations. The intended life expectancy and life cycle of much of current real estate development has decreased, many barely built to outlast their initial twenty to thirty year mortgage terms. Single-use zoning and resulting buildings which are designed for only one specific purpose have become the norm. A battle cry is an effective tool in attacking tough issues. We have fought a “War on Poverty” and a “War on Drugs,” now it appears that we are in a “War on Blight.” A war on blight will be a long and challenging campaign. Like these other previous domestic battles it is difficult to define the root cause or to single out the enemy, however the residual effect of blight is apparent on the health, safety, and welfare of the community. Andy Kitsinger is a principal consultant at The Development Studio, a firm focused on helping clients build stronger communities. 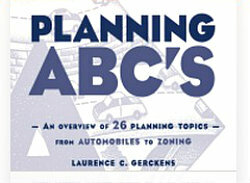 He writes about Downtown and Main Street Issues. Kitsinger’s thirty-year career as an architect, urban designer, city planner, and teacher has focused on creating authentic places that are strongly influenced by their context and have a positive impact on their community. 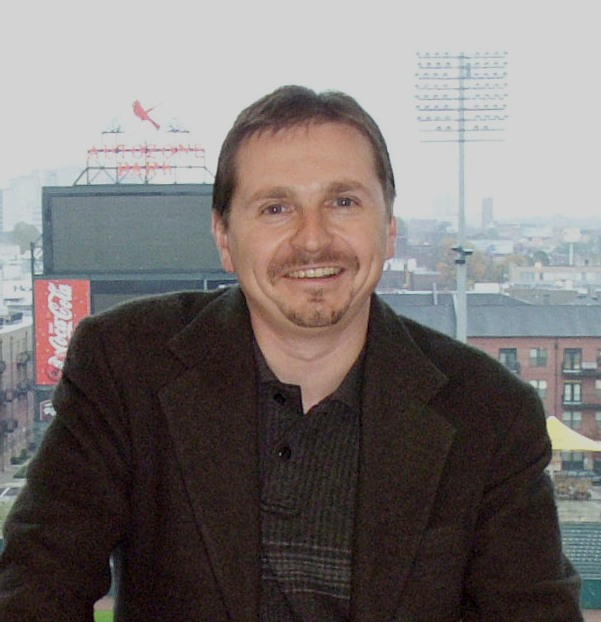 He teaches Issues in City Building and Architectural Design Studio at the University of Memphis’ Department of Architecture. Kitsinger served as the Senior Vice President of Planning & Development for the Downtown Memphis Commission (formally Center City Commission) for the last eight plus years where he helped continue the momentum of downtown while working to improve the livability and the quality of life in the City.